The medial branch nerves are a set of tiny nerves which transport pain signals to the brain from the facet joints. The facet joints, also scientifically referred to as zygapophysial joints, make up the spinal bones and these are the small bones that connect the vertebra. When these facet joints have inflammation, the patient will suffer from back pain and this will radiate through the lower back to the buttocks as well as the upper thighs. This pain could also be felt on the neck right through the shoulders and this could make turning the head side ways difficult and painful. The pain is diagnosed with the procedure termed a medial branch block. This injection is applied around the medial branch nerves and is meant to block out pain signals coming from the nerves to the brain. The medial branch block procedure is primarily diagnostic and this means that the patient may need to undergo further treatment. Like we mentioned the medial branch block is injected around the medial branch nerves and it works by providing pain relief. For a work injury where the person has neck or back pain, an Arizona or Federal workers compensation doctor may need to perform a medial branch block to help diagnose the pain source. Pain relief helps to determine the source of the pain and usually, several spine levels will be injected in a single procedure. All this is to try and diagnose the source of the pain. The second reason a medial branch block is performed is for pain relief. Studies show that a medial branch block procedure can provide three months of pain relief on average. So it truly is not just a diagnostic procedure but also therapeutic. local anesthetic such as lidocaine. 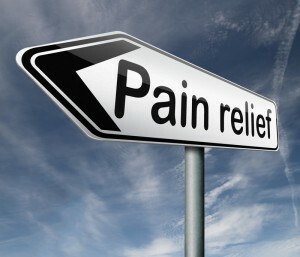 The medication is usually injected on various medial branch nerves and this is to block the pain from one joint. 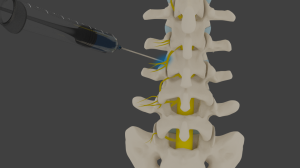 Each spinal joint has a nerve supply from several medial branches (above and below), so the block incorporates an injection around both areas above and below the joint. If no pain relief is achieved from one of the nerves injected, then this would mean that the workers compensation doctor has yet to find the cause of the back or neck pain. The injection is administered using the fluoroscopic method which is a real time x-ray. 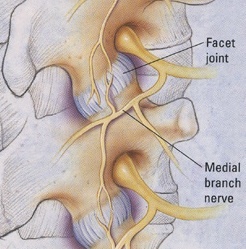 The needle is placed close to the medial branches which are found adjacent to the facet joints above and below. The work of the x-ray is to ensure that the injection is properly placed and this is followed by the anesthetic injection itself. The injection feels a lot like pressure on the back or neck and small amounts of the anesthetic are injected on each nerve. This is an outpatient procedure and patients are discharged about half an hour after the injection. However; it is advised that the patient rest for the day before resuming to normal duties the following day. Many candidates who undergo this diagnostic procedure will have another medical procedure when the pain relief wears off. This may entail another medial branch block or a phenol injection around the medial branches which may provide longer term pain relief by “deadening” the nerve endings for a longer period.